Washington: Democrats raised questions on Monday about whether Neil Gorsuch, President Donald Trump's US Supreme Court nominee, would rule against abortion rights and gun control while favouring corporations as his Senate confirmation hearing began, with the court's ideological balance at stake. Judiciary Committee Republicans praised Mr Gorsuch, the conservative appeals court judge from Colorado nominated by Mr Trump on January 31, and called him well qualified for the lifetime job as a justice. Despite slim chances of blocking the nomination in the Republican-led Senate, Democrats raised questions about Mr Gorsuch's suitability for the court. 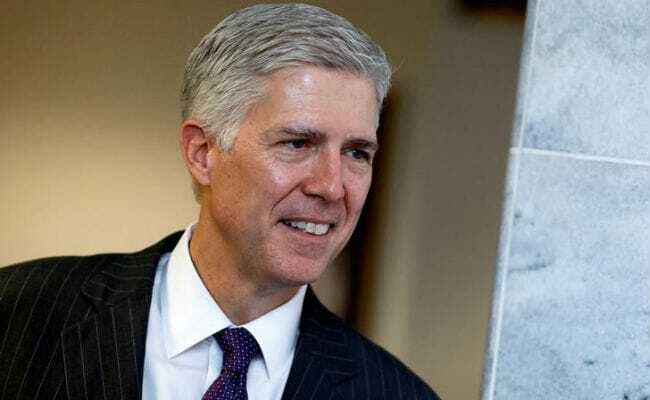 Committee Democrats noted that Mr Gorsuch has the chance to join the court only because Senate Republicans last year refused to consider Democratic former President Barack Obama's nomination of federal appeals court judge Merrick Garland. "Our job is to determine whether Judge Gorsuch is a reasonable, mainstream conservative or is he not," said the panel's top Democrat, Dianne Feinstein. Republican Senator Chuck Grassley, the committee's plain-spoken chairman, said the panel is likely to vote on the nomination on April 3, with the full Senate vote likely soon after. Mr Gorsuch was set to give his opening statement later in the day and face questioning by senators on Tuesday. Democrats highlighted cases on which Mr Gorsuch has ruled and questioned the influence of conservative interest groups in advising Mr Trump on his selection. Mr Gorsuch, a cool-headed and amiable jurist, sat quietly, sometimes smiling, nodding or taking written notes. Ms Feinstein emphasised abortion in particular. Conservatives have long opposed the landmark 1973 ruling called Roe vs Wade in which the court found that a woman has a right under the US Constitution to terminate a pregnancy. Ms Feinstein called that ruling and others since then buttressing legalised abortion "super precedents" that deserve special deference. Ms Feinstein cited two Gorsuch legal opinions in which she said he "argued in favour of making it harder to convict felons who possess guns." Fellow Democrat Patrick Leahy said he was worried that Mr Gorsuch's conservative method of interpreting the Constitution "goes beyond being a philosophy and becomes an agenda" that is anti-abortion, anti-environment and pro-business. "Will you allow the government to intrude on Americans' personal privacy and freedoms? Will you elevate the rights of corporations over those of real people? Will you rubberstamp a president whose administration has asserted that executive power is not subject to judicial review?" Mr Leahy said. If Mr Gorsuch is confirmed by the Senate, as expected, he would restore a narrow 5-4 conservative majority on the court. The seat has been vacant for 13 months, since the death of conservative Justice Antonin Scalia in February 2016. The hearing could go as long as four days, providing classic Washington political theatre.